These Butter Cookies remembered me the Butter Biscuits. During my childhood, i remember my mom used to send all the necessary ingredients for the butter biscuits in big buckets(thooku) to our nearby town villupuram. Our Helper Pushpa takes them to some bakery in villupuram and comes home with butter biscuits taking pain in lifting all along thru bus. Life at villiage surely lacks luxuries but i bet, They are Full of Memories!! These were Melt in mouth kind of cookies, and at home we all loved it much. When there is so much of butter will it go wrong? Pre-Heat the oven at 180C for about 10 mins. Line the Baking tray with butter paper or aluminium foil sheet. Whisk a egg and keep it seperate. In a mixing bowl, put the butter and powdered sugar and whisk until light and fluffy either with your hand mixer or a whisk. add the whisked eggs. Sieve the flour with baking powder and baking soda for about 2 or 3 times. add the sieved flour to the mixing bowl and gently fold in. make sure to mix with spatula and fold the flour gently. 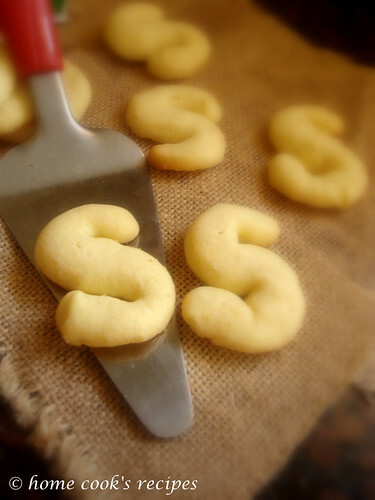 Pinch a small amount of dough, roll it with your palms to the thickness of your finger, place it on the butter paper and shape it in "S" shape. Give enough space between cookies, so that it can expand while baking. Bake the cookes at 180C for about 12-15 mins, till you see the bottom of the cookies turn golden in colour. Cool the Cookies after baking and transfer them to an air tight container. I also made round cookies, as i did not have patience to shape all the 40 cookies. S shape was much loved by the kid! It will be a great school snack and party snack! 1.You can give egg wash over the cookies to get crisp cookies. 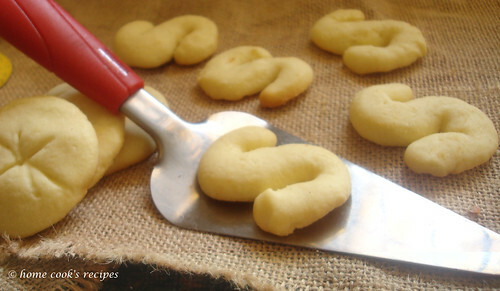 this cookies can also be prepared without eggs. 2.The Cookie Dough can be wrapped up with cling wrap and cooled at fridge. after cooling, knead them gently and roll them off into 1/2 inch thickness. 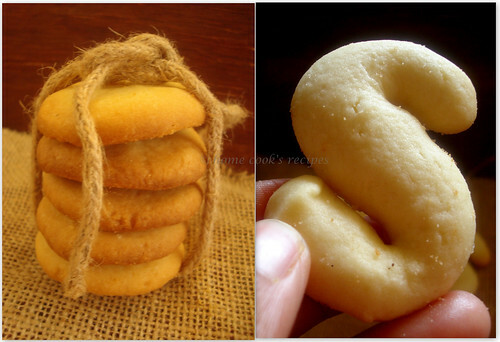 you can then use cookie cutter over the rolled dough and furthur bake them. 3. The Actual recipe used silvered almonds as the topping to the cookies, do try it out to. 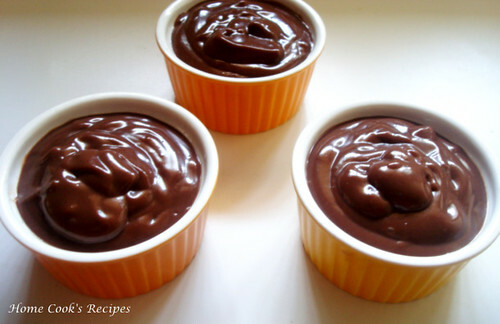 I found this Silky Chocolate Pudding from Smitten Kitchen. i prepared this pudding for my apartment kids and they loved it so much. they came to me one day asked me to prepare again and saw me live preparing the pudding and they went home and prepared just like i did. One of the kid's Grandmom was so impressed and asked me, where i found the recipe? believe me the kids prepared the pudding more than me and even they brought me what they made to taste, it was so so Gooood! 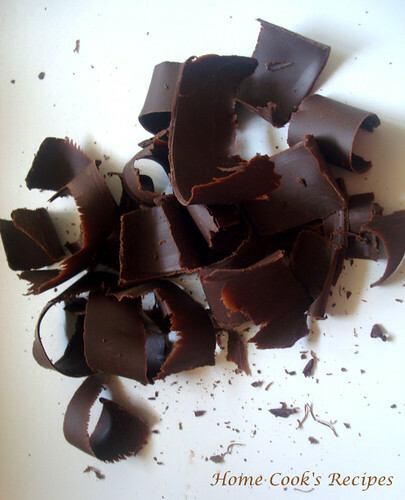 Dark Chocolate - 1 and 1/4 cup (or) 6 oz. Use Double Boiler or Boil water in a big bowl and fit another empty bowl over the big bowl. simmer the flame once the water starts to boil. Grate the Dark Chocolates or cut them into small pieces. Add Corn Flour, salt a pich, Sugar to the empty bowl and mix well. If using Cocco powder, add it too. slowly add milk one cup at a time and mix well with a whisk. see to that no lumps are formed. Keep Stirring with the whisk in slow flame for upto 5-8 mins till the mix gets thicker, or it should coat the spoon. Once the mix got thickened, add Dark Chocolate and mix well with the whisk. the chocolates melts and mixes well with milk and corn starch. once it all turned chocolatey, remove from the bowl and add vanilla essence and mix. If you wish you could strain the pudding in the stage, if you feel some lumps in the pudding. Let the Pudding cool and transfer them to small cups. cover them with a cling wrap and refrigerate for upto 2hrs. Serve them chill. 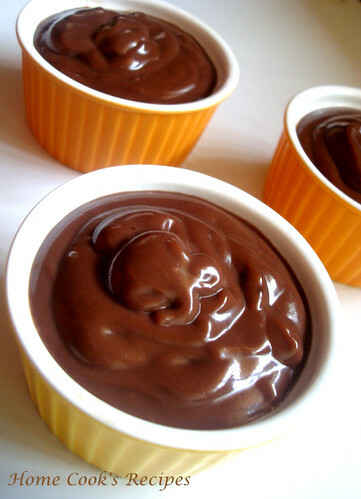 Adding Chocolates or coccoa powder can be skipped and the pudding can also be enjoyed plain as Vanilla Pudding. It Tastes Good! 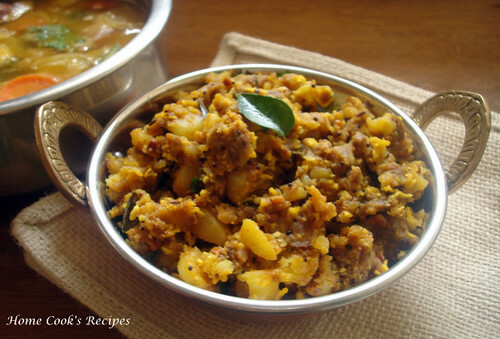 Any South Indian will crave for Sambhar and Potato side-dish. iam not an exceptional. I always want my lunch hot and so cooking just before lunch time is my choice. also i hate to chop vegetables the day before or some hrs before cooking and all those stuffs. i will chop my veggies just before cooking it. Today soon after i came home after picking my son from school, i kept pressure cooker with rice, and dal for sambhar. and got ready with potatoes to make potato poriyal. Rice, Sambhar and Urulai poriyal got ready in 20 mins. If you have microwave, pop appalams in it. 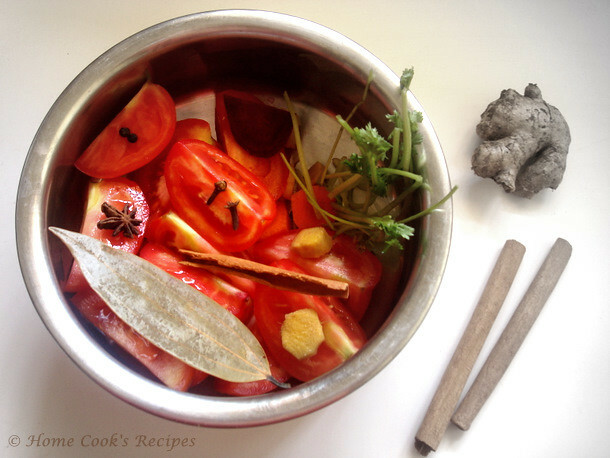 then you could make rasam, which would take less than 10 minutes. 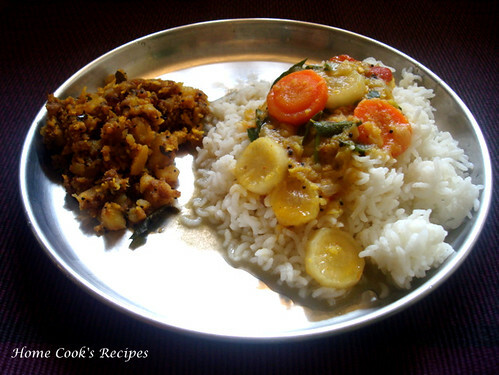 enjoy your Lunch within 30 mins with Rice, Sambhar, Poriyal, Appalam, Rasam and Curd. so simple is'nt it. I tried this potato poriyal like potato podimaas. it came out good. a little tangy from lemon complimented the spicy potatoes. i added grated coconut. coconut and lemon juice are optionals. it comes out tasty and instantly. Peel the skin of the Potatoes and chop them into small pieces. Heat 2tbsp of oil in a Pan, add mustard and let it splutter, add split urad dal, cumin, asafoetida powder, and curry leaves. roast them all. Next add Sambhar powder, a pinch of turmeric powder, Corriander Powder & Salt to taste and saute them in the oil for a minute. 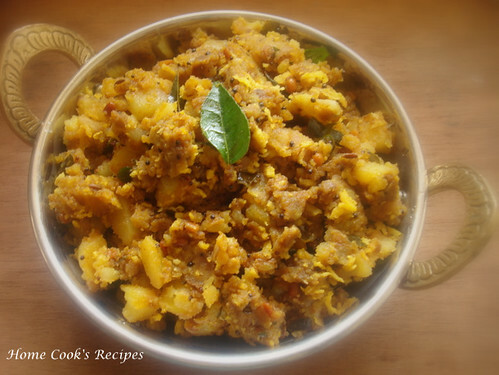 Add the chopped Potatoes to the Pan and mix well with the masala's. simmer the flame and let it rest for a minute, for the potatoes to absorb the flavours of masala's. Add 1/4 cup of water to the pan , mix well and close the pan with its lid and let the flame be in sim for about 5 mins, till the potatoes are nicely cooked. After the Potatoes are cooked, remove them from flame, while removing the poriyal from the pan, also scrap the masala's sticked to the pan. add the grated coconut and lemon juice and mix well. 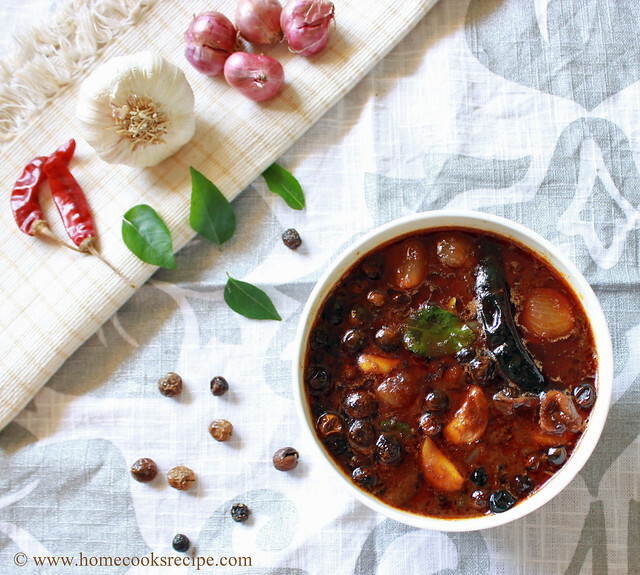 Serve Hot with Sambhar Rice or Vathakuzhambu Rice. 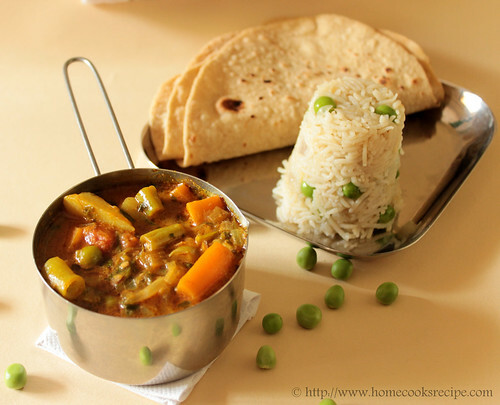 How to Prepare Sambhar Quick? Chop 1 carrot, 1 radish, 1 onion, 1 tomato into pieces. add them all to the 1/4 cup of toor dal with 1 cup of water, a pinch of turmeric powder, a pich of asafoetida and a drop of oil. Pressure Cook all for upto 4 whistles. 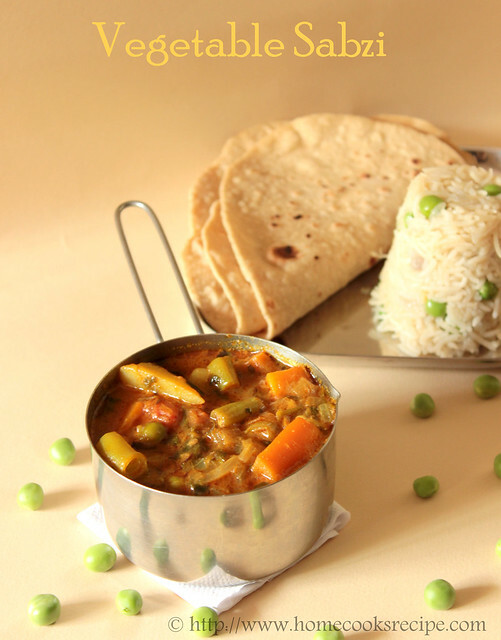 You can add other vegetables like Drumstick, brinjal and beans. Heat a tsp of oil in a pan, add 1/2 tsp mustard, 1/4 tsp fenugreek, a pinch of asafoetida, 1 sprig of curry leaves, 3 dry red chillis's and roast them all. Now add cooked toor dal and 2 cups of water. add 2 tsp of sambhar powder and a tsp of tamarind paste and mix well. add salt to taste. Garnish the Sambhar with chopped corriander leaves. 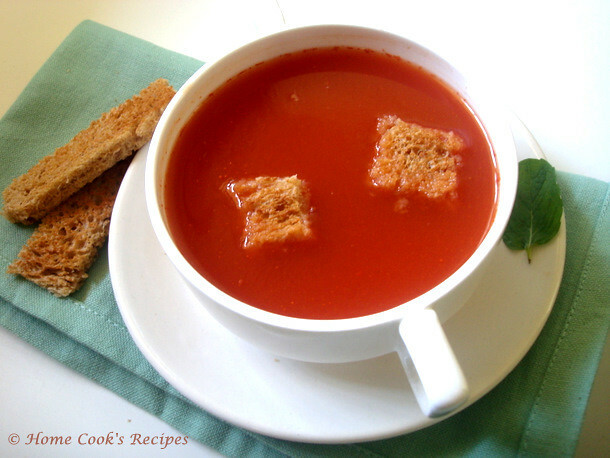 I am Crazy about Tomato Soup, which my grandmother used to make with loads of vegetables in it. 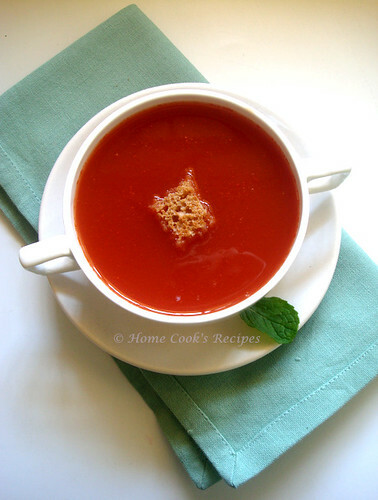 apart from that, when i wrote a story for the first time at my class 7, has Tomato Soup played an important role. to brief the story here, the girl in the story drinks lots of tomato soup and suffers from stomach ache and the girl's sister gets caught in trouble while going out to get medicine. though it sounds funny now, the memories are as bright as the soup color! While speaking about the bright red color of the soup, it all comes from a small bit of beetroot. that's a trick i got from Suganya's Tasty Pallette. Cut the tomatoes into 4 parts and transfer them into a vessel that could fit in your pressure cooker. add the spices bay leaf, cinnamon stick, cloves, star anise and pepper to the tomatoes. add ginger and garlic too. add a small bit of beetroot, coriander stems and 1 cup of water. pressure cook all together up to 3- 4 whistles. alternatively you can cook them stove top for over 5-10 mins or also microwave them at very high for about 5-6 mins. just add an inch size of cinnamon stick, i had put one big one for the photo to show you all. Cool them and remove the spices(cinnamon,cloves,star anise and bay leaf) except pepper. Meanwhile prepare the corn starch by mixing 2 spoons of corn flour with 1/4 cup of water without any lumps. Grind the tomatoes and filter the soup. boil the soup. add the corn starch to the boiling soup and give a stir. let the soup boil in slow flame for about 2-3 mins. add salt to taste, bit of pepper powder and serve hot! 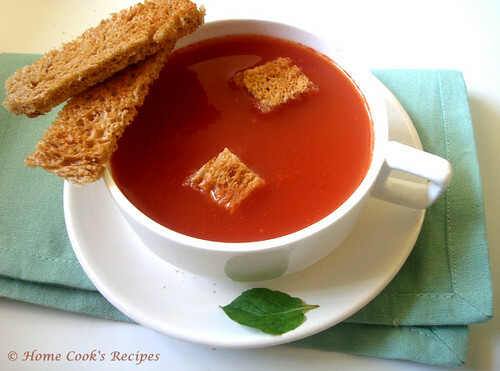 Serve the Tomato Soup hot with Toasted Bread. Before grinding the tomatoes, remove the skin of the tomatoes(its easy). and then grind together. boil the grounded soup, add the corn starch at slow flame and stir well so that no lumps are formed. add a bit of pepper powder and salt to taste. let the soup boil in slow flame for about 2-3 minutes. and serve hot. My School Lunch boxes used to be filled with Thayir sadam or with Pulicha keerai sadam or with idli, milagaai podi. I like all the three and never complained. Thayir Sadam is my most favourite and i survived on it, when i was newly married, the reason is i dont know to cook other than that. To my Surprise, My Son loves Curd Rice very much like me. Last month, one day, we had our Lunch at Krishna Sweets owned Rasam Restaurant at Venkata Narayana Road, Tnagar, Chennai. The menu had Kongunadu specials, hubby ordered a Thali and i ordered Tulasi Vadai and Uthukuli Thayir sadam. 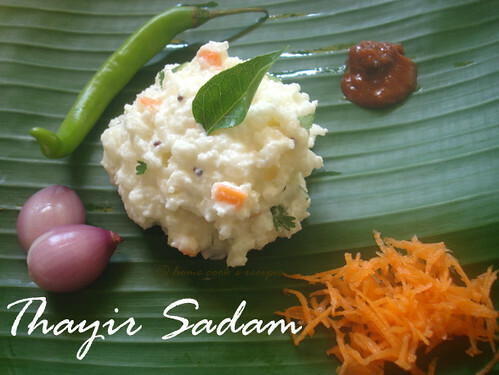 Thayir sadam was Very Divine to us and i know i will be blogging it here soon after i tasted it. Yes this Curd Rice has to be called as Uthukuli Thayir Sadam. Uthukuli is famous for Butter and i used to buy the Uthukuli White Butter for cooking now and then. I love the way its packed in Banana Leaf. How to Prepare Uthukuli Thayir Sadam? * You can also use Normal Cooking butter. 1. Pressure Cook One Cup of Rice. Rice has to be Over cooked, so that it could be easily mashed. Pressure cook the rice upto 5 whistle count. 2. Mix 2 tbsp's of Uthukuli Butter to the Hot rice and mash the rice with the back of the spoon. The butter and rice should get mixed up well. 3. Add One and Half cup of Thick Curd to the rice and mix well. add salt to taste too. 2 Green Chilli's finely chopped. roast the above and remove from the flame. 5. Add the Tempering to the Curd Rice and mix well. 6. 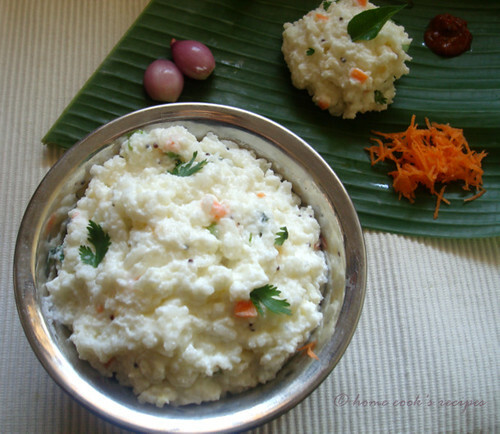 Serve the Curd Rice with Pickle or Mor Milagaai. Note: Prepare the Curd Rice ahead and chill them for atleast 20 minutes before serving. If you are Curd Rice Lover, do give it a try. I highly recommend this for Kids. 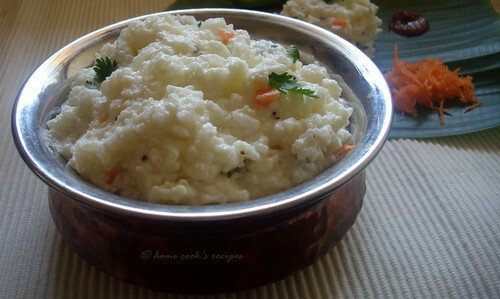 also this Curd rice will be a great treat for your Guests. 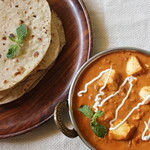 Vegetable sabzi can be prepared in dry and in gravy form. i am sharing both recipes with you here. Initially i bought sabzi masala, that is available in the market and used it, later, i stopped buying the sabzi masala and added chilly powder, corriander powder, garam masala and kauri methi to my sabzi. it gave the same taste as the sabzi masala available in the market. but i am desperate in knowing what all go into sabzi masala. If you know, please share with me. Heat oil in a pan, add cumin and let it get roasted. Add finely chopped tomatoes to the pan, Let the tomatoes shrink and mash them on the pan with the slotted spoon. add turmeric powder, chilli powder, garam masala and salt to taste. mix the masala well with the tomatoes. 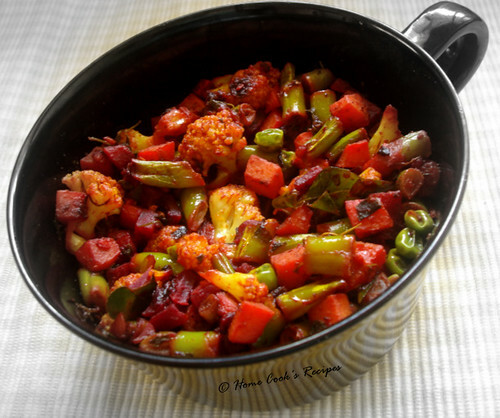 Add the chopped vegetables to the pan, mix the veggies well with the tomatoes and the masala. add kasuri methi and give a mix. Sprinkle 2 tsp's of water over the pan and close the pan with its lid. let the vegetable's simmer in slow flame for about 5 -10 minutes till the vegetables get half-way cooked. as i do not like over cooking the vegetables, i removed the sabzi, when the vegetables are half-cooked. 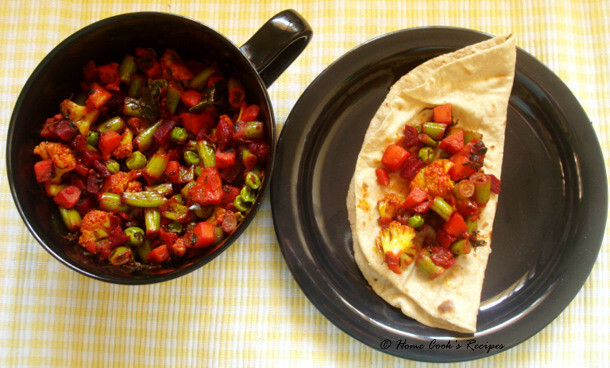 Serve the sabzi with Chapathi's. In a wide bottomed pressure cooker, add oil and heat it. add cumin and let it roast. Add finely chopped onions, bit of salt and saute till they turn translucent. then add ginger garlic paste and saute it till the raw smell leaves. and mix well with the onion and tomatoes. Then add in the chopped vegetables and mix well. add a cup of water and kasuri methi and give a mix. check for salt and add as per your taste. then add the chopped corriander leaves and close the pressure cooker with its lid. let the sabzi pressure cook for up to 2 whistles exactly. switch off the flame and let the steam escape. Now transfer the sabzi to a serving bowl. 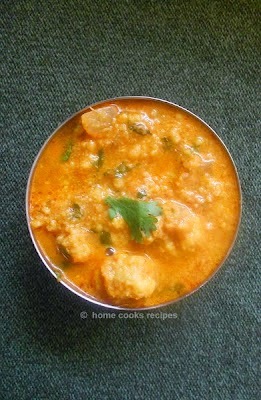 Serve with Chapathi or Roti. 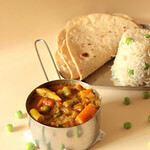 I enjoyed it with phulkha and peas pulao.